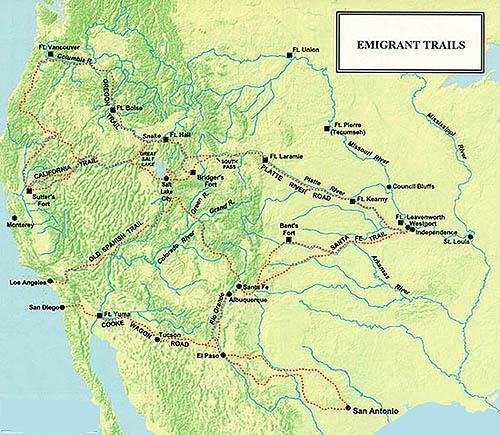 1830 Indian Removal Act: K-12 TLC Guide. 1838-39 Trail of Tears: K-12 TLC Guide. California Gold Rush: K-12 TLC Guide. Native-American Studies: K-12 TLC Guide. The Oregon Trail: K-12 TLC Guide. The Shootout at the OK Corral: K-12 TLC Guide. The Telegraph: K-12 TLC Guide. Thomas Jefferson's Third Annual Message to Congress: K-12 TLC Guide. 09/021885: 28 Chinese Miners Murdered in Rock Springs, WY: K-12 TLC Guide. 10/31/1803: Congress OKs Purchase of Louisiana Territory. 11/07/1805: Lewis and Clark Reach the Pacific Coast. 11/07/1811: Harrison Victorious at Battle of Tippecanoe. 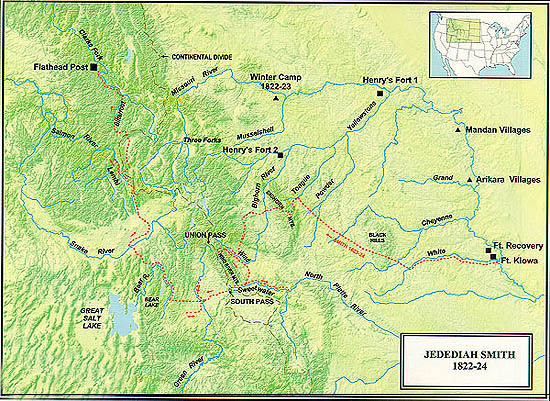 11/27/1826: Jebediah Smith First Across SW U.S.. The American Western History Museums. Billy the Kid: K-12 TLC Guide. Black Hawk's Surrender (1832): K-12 TLC Guide. "Buffalo Hunts Man", Muskingum College. Cassidy, Butch: K-12 TLC Guide. Catlin, George: K-12 TLC Guide. Central Pacific Railroad Photographic History. The Dakota Conflict Trials (1862), University of Missouri-Kansas City. Doc Holliday: K-12 TLC Guide. The Donner Party: K-12 TLC Guide. Eyewitness: History through the Eyes of Those Who Lived It. The Gold Rush: K-12 TLC Guide. Goodnight, Charles: K-12 TLC Guide. Heritage Gateways, Utah State Office of Education. Hickok, James Butler "Wild Bill": K-12 TLC Guide. 04/06/1808: John Astor Incorporates the American Fur Company . 09/08/1810: The Pacific Fur Company's first ship leaves for Oregon. 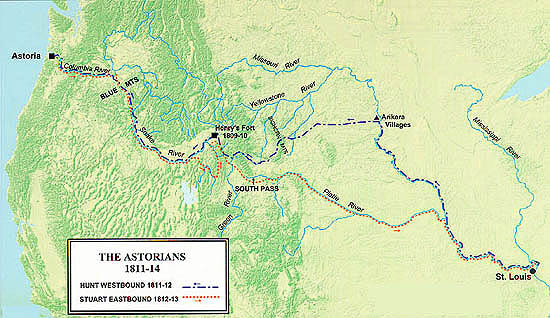 02/15/1812: Wilson Hunt Expedition Arrives in Astoria, Oregon. 11/16/1821: Indian Trader, William Becknell, Arrives in Santa Fe, New Mexico. 09/03/1855: Sioux Village Attack Avenges Grattan Massacre. 12/16/1826: Benjamin Edwards Declares Texas Republic of Fredonia. 09/01/1836: Narcissa & Marcus Whitman, Arrive in Walla Walla, WA. 11/17/1856: U.S. Establishes Fort Buchanan in Southern Arizona. 09/11/1857: Mormons & Paiutes Murder 120 Settlers. 09/15/1858: Overland Stage Initiates Coast-to-Coast Mail Service. 10/29/1858: First Store Opens in Denver, CO.
03/10/1864: Vigilantes Clean Up Virginia City, MT. 10/30/1864: Helena, MT Founded After Gold Discovery. 12/21/1866: 2,000 Indians Massacre 81 U.S. Cavalry Outside Ft. Kearney, WY. 10/18/1867: U.S. Takes Possession of Alaska. 09/17/1868: Battle at Beecher's Island. 05/18/1871: Kiowa Chief Satanta Leads Massacre of Texas Wagon Train. 11/09/1875: Government Reports Hostile Sioux & Cheyenne. 09/04/1886: Geronimo Last Native American to Surrender. 1887: Harsh Weather Decimates Lifestock & Ranchers. 08/29/1911: Last Living American Stone Age Indian Found. 11/02/1912: XIT Ranch Sells Its Cattle. 05/26/1864: President Lincoln Creates the Montana Territory. 10/24/1864: First Transcontinental Telegraph Line Completed. Marcus Whitman and Whitman Mission: K-12 TLC Guide. The Fur Trade: "Beaver Powered Mountaineering". "Life in California Before the Gold Discovery". Museum of Westward Expansion, The National Park Service. The California Gold Rush (audio: 8:15). Who Were the Cowboys Behind 'Cowboy Songs'? Winning the West with Fred Harvey Restaurants. 10/09/1858: Mail Service Begins: San Francisco - St. Louis. New Perspectives on the West. 150 Years Later, Pony Express Rides On In Legend. Starr, Belle: K-12 TLC Guide. Tilghman, William: K-12 TLC Guide. Trails West Web Ring, Yahoo! Utah History Encyclopedia, University of Utah. Wells, Henry: K-12 TLC Guide. The Westward Movement, Middle School Cybrary. WestWeb, City University of New York. Which "Old West" and Whose?, University of Wisconsin. Expansion and Reform, The Smithsonian Institute. Fort Scot National Historic Site, National Park Service. John L. Sullivan on Manifest Destiny, 1839, Mount Holyoke. Native American Heritage: K-12 TLC Guide. Wild Fires/Forest Fires: K-12 TLC Guide. Fire Safety: K-12 TLC Guide. J. Clark Salyer NWR Grassland Trail. Lewis and Clark: K-12 TLC Guide. Boundaries of the United States and the Several States. Exploring the West from Monticello. 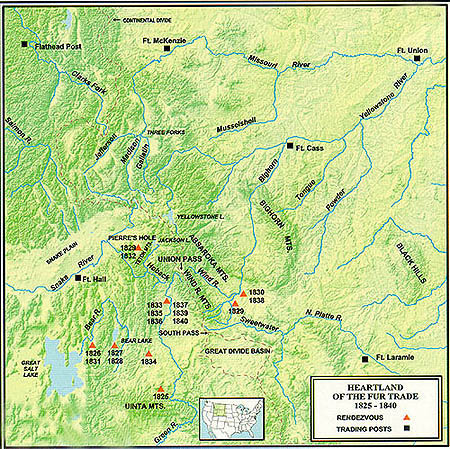 Rendezvous in the Rockies: 1825-1840. Becknell, William: K-12 TLC Guide. Biertadt, Albert: K-12 TLC Guide. Bridger, Jim: K-12 TLC Guide. Colt, Samuel: K-12 TLC Guide. Fr�mont: John C.: K-12 TLC Guide. Garrett, Pat: K-12 TLC Guide. de Guill�n Marin�, Eulalia P�rez: K-12 TLC Guide. Mix, Tom: K-12 TLC Guide. Powell, John Wesley: K-12 TLC Guide. Slade, Jack: K-12 TLC Guide. Smith, Jedediah: K-12 TLC Guide. 01/24/1848: The Discovery of Gold at Sutter's Mill in California. 05/06/1877: The Surrender of Chief Crazy Horse. 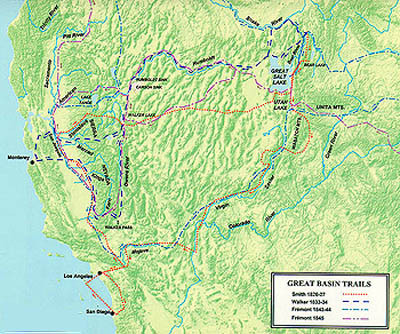 05/22/1843: Departure of the First Organized Wagon Train on the Oregon Trail. 05/28/1830: Andrew Jackson Signs into Law the 1830 Indian Removal Act. 10/20/1803: U.S. Senate Ratification of the Louisiana Purchase. 11/28/1785: The Treaty of Hopewell. U.S. History: K-12 TLC Guide. Donner Online, Knowledge Network Explorer. Battle of Horseshoe Bend: Collision of Cultures. Skagway: Gateway to the Klondike.